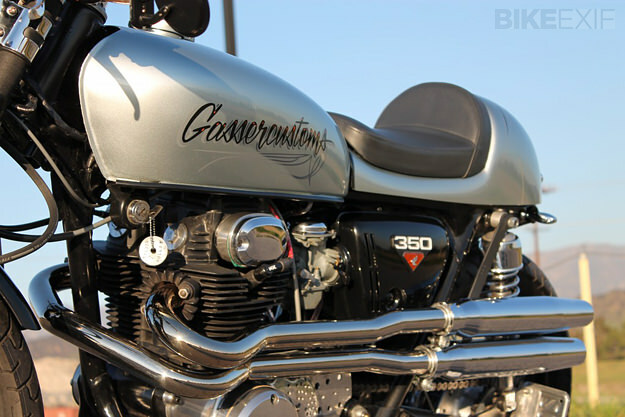 Gasser is a custom and vintage bike shop in Southern California that we haven’t come across before. 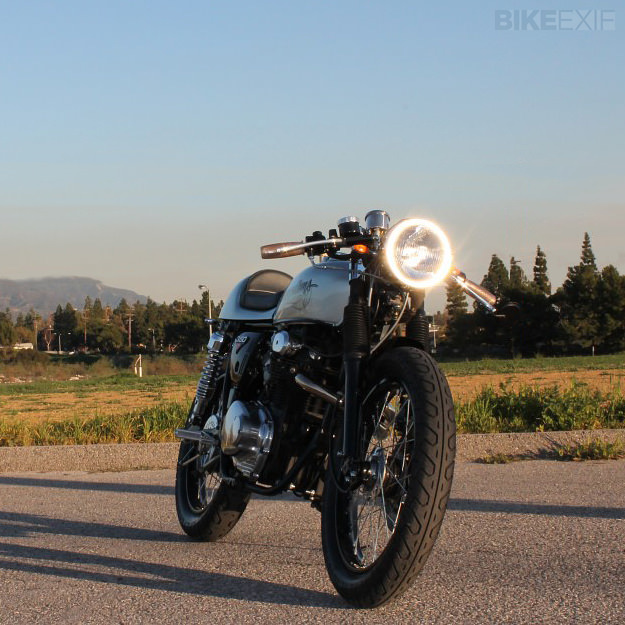 But it’s a name to watch: the Honda CB350 shown here has just taken first place in the ‘Classic Metric’ class at the L.A. Calendar Bike show in Long Beach. 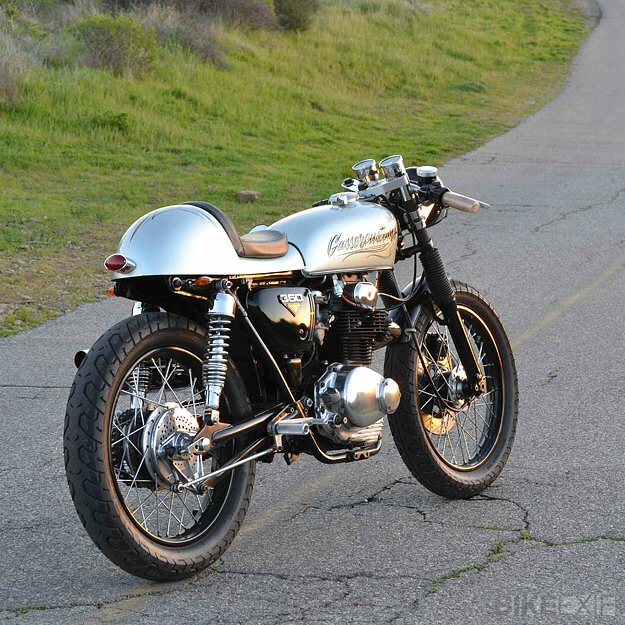 Builder Adam Gaspic has put a lot of work into the CB350, which arrived at his workshop in boxes. It’s actually easier to say what hasn’t been modified than what has, but here’s a taste. The engine has been totally rebuilt back to factory specs, with new valves, springs, gaskets and seals throughout—plus a .50 mm overbore for the cylinders. New pistons were installed, and Adam planed .010 thou off the head and treated it to a light port job. The carburetors have been completely rebuilt and jetted for the pod filters and scrambler pipes, which Adam fashioned from 304 stainless steel. The electrics have been refreshed with a rewire and new Dyna ignition coils, and the driveline was reinvigorated with a new clutch and a 17-tooth sprocket. The frame was stripped back to bare metal and detabbed and modified to take the café-style seat. The tailsection is now fiberglass. The front end was stripped down and rebuilt, and vintage-style shocks with progressive springs fitted at the back. The wheels have been powder coated and laced with new spokes. 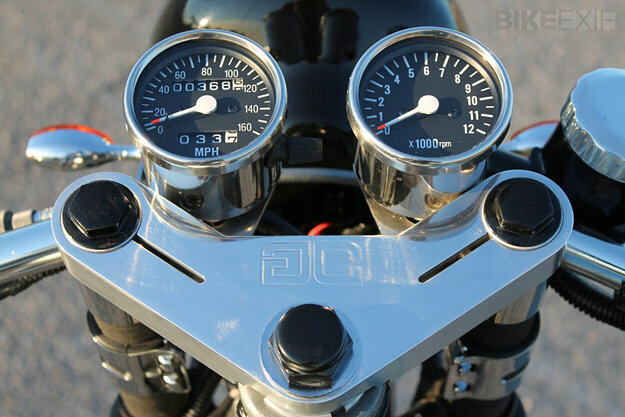 Also featured on this bike are Gasser Customs’ new billet aluminum top triple trees (above), which have just gone on sale through Gasser’s online store along with the scrambler pipes. “The bike rides as good as it looks,” says Adam. 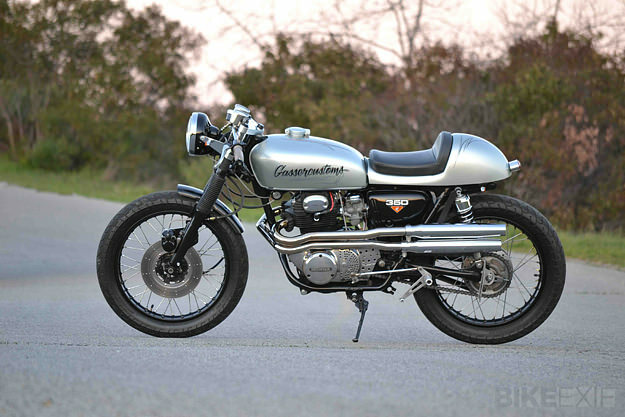 “It corners like it’s on rails, and breaks necks wherever it goes!” And like all CB350s from Gasser Customs, it can do the ton—and then some. Good to see a show-winner that’s equally at home on the road. Head over to the Gasser Customs website for more vintage goodness.